Is it just me, or was January just starting? Boy, I can’t believe that we are already into February and Valentine’s Day is right around the corner! 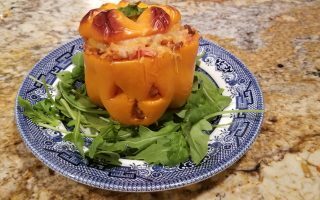 It has been a busy start to the year for the Momleficent clan with schedules and after school activities, volunteering and a all of the things that we Moms have to do. 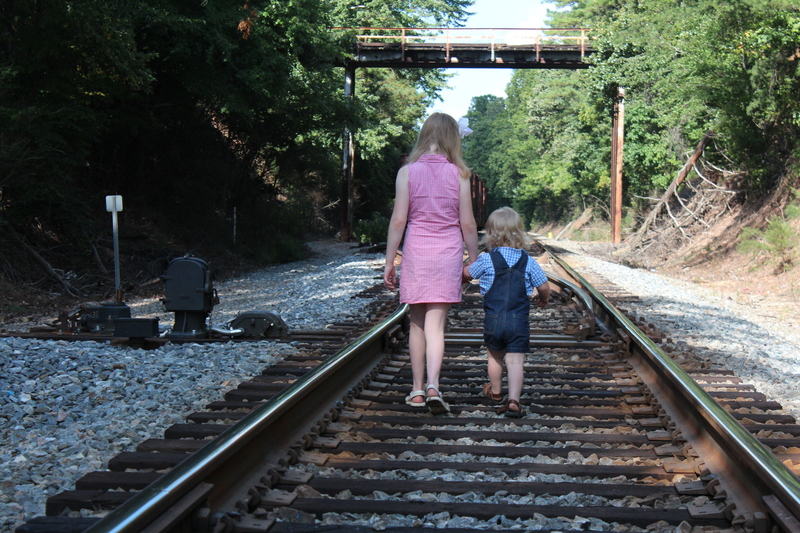 This year seems a little busier for us than usual, and it is getting harder and harder to squeeze in that quality time during the week that I like to have with the kids. A lot of our crafting is getting bumped to the weekend so that homework and reading can be done during the week. One of our most recent projects was this festive wreath. Tiny is getting into a phase where she wants to decorate for every holiday. I don’t usually do much for anything other than Fall/Thanksgiving and Christmas. Those are my two biggies. To compromise so that my house would not be covered in little paper hears and big red lips, we decided to add a few accents to our existing deocor. This wreath was the only item we decided to put outside. 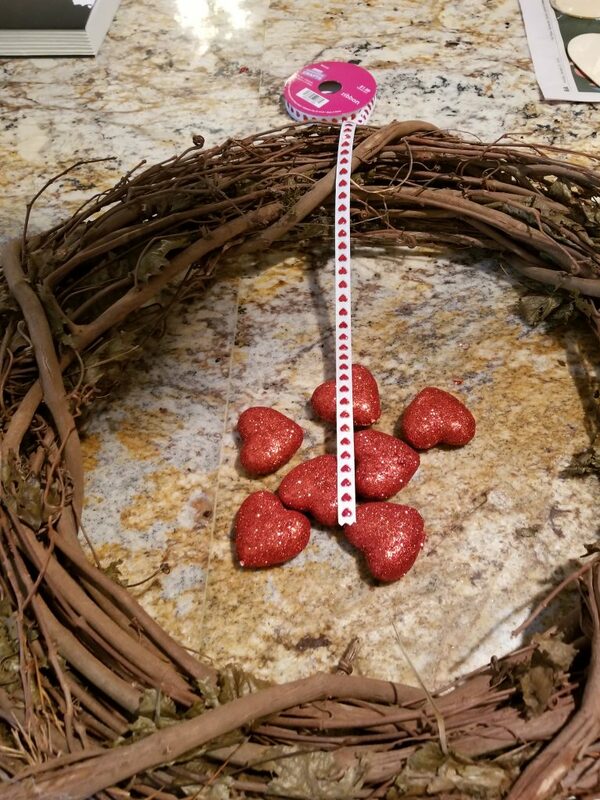 She loved it – and the fact that she got to have some say in the decorations – where are the days when doily hearts were sufficient? 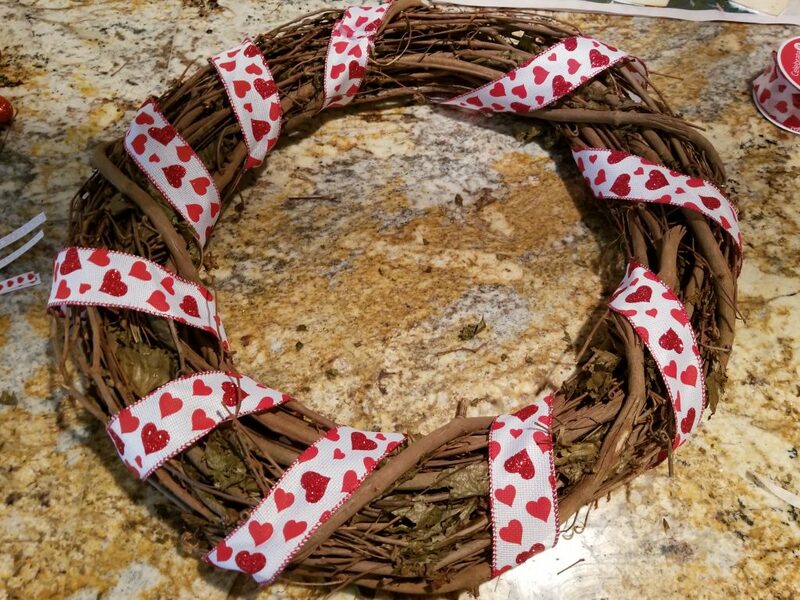 To make this wreath, we started with a handful of basic materials that are all super cheap. 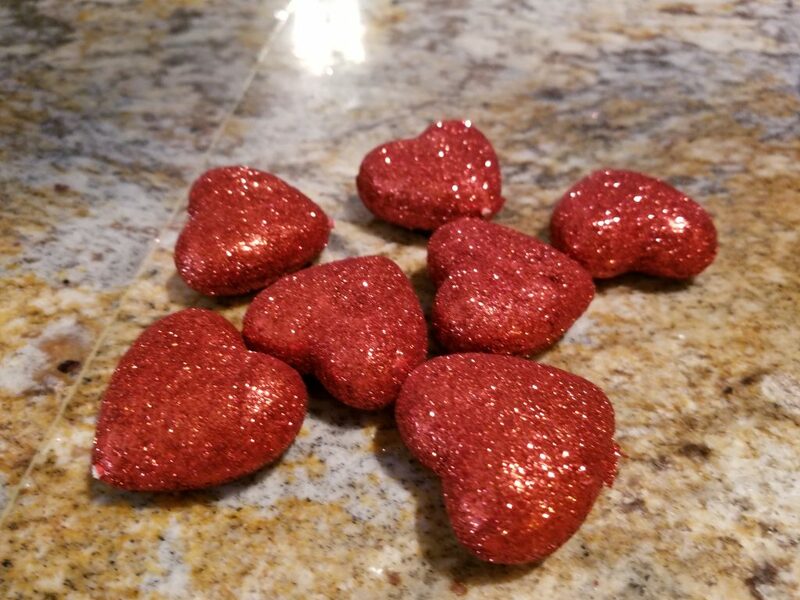 The little glitter hears we used came from the Dollar Tree! Everything else can be picked up from your local craft store. 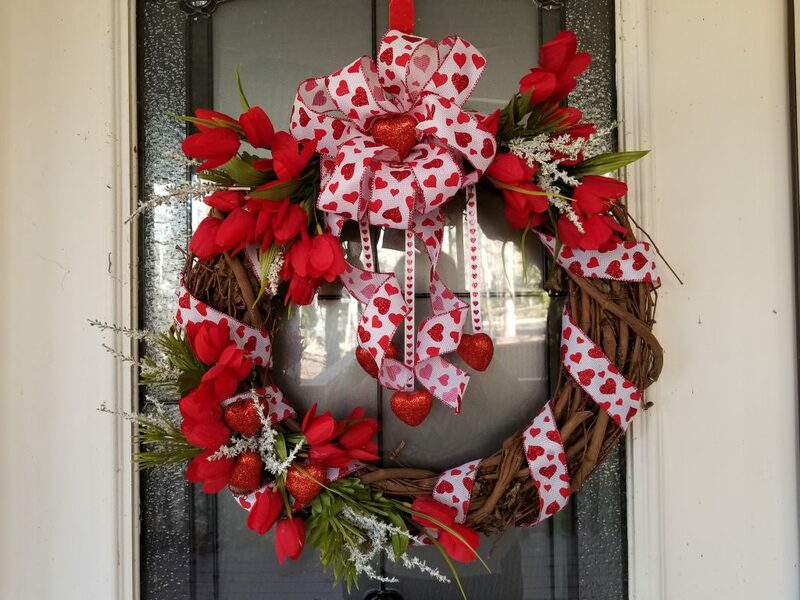 2 spools of ribbon of your choice, glue gun and glue, 1 24 inch length of floral wire, 1 grape vine wreath, 1 spool of thin accent ribbon, 4 stems of tulips in the color of your choice (small stems were only $2.00! You will use the flower and the leaves. 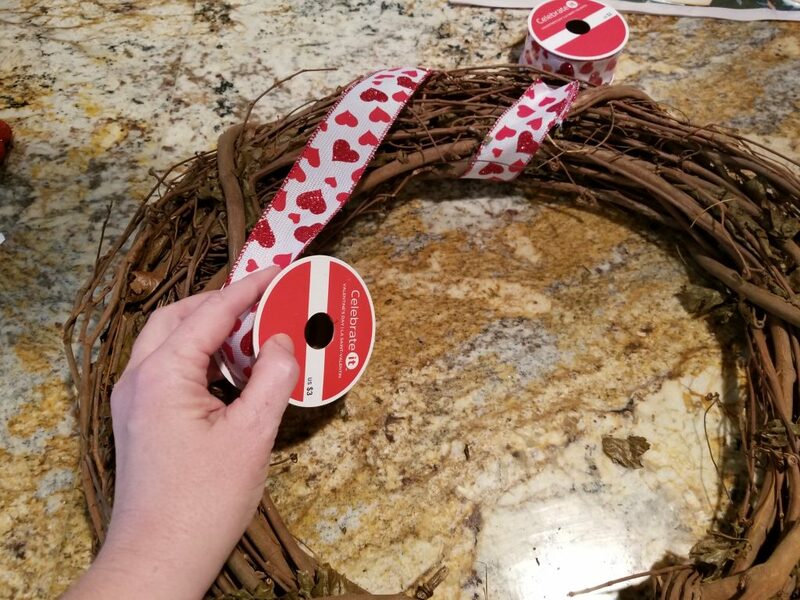 Begin by securing your wreath ribbon to the back of the top of the wreath with a bead of glue in the direction you want to wrap the ribbon. Begin wrapping ribbon (I seem to always go counter clockwise). Don’t worry if it is a little uneven right now, we can straighten it up. Cut and secure ribbon to the wreath where the ends meet. 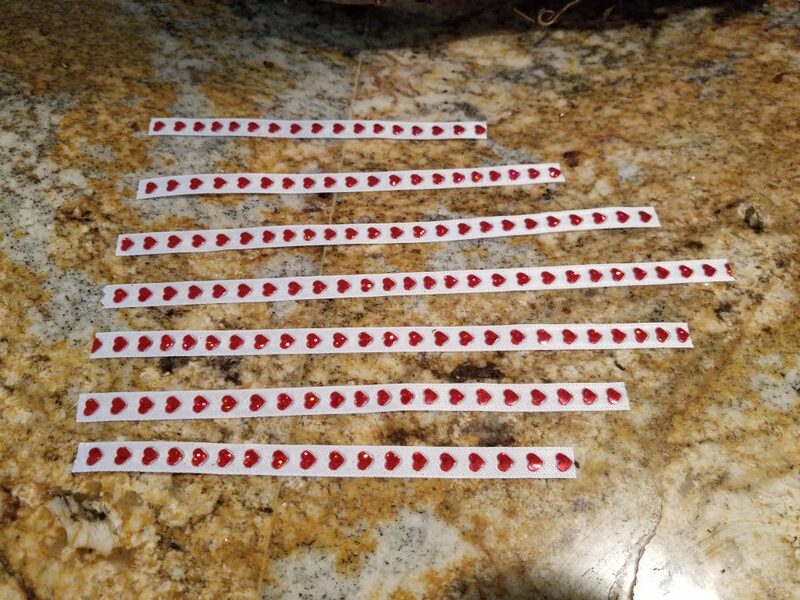 Cut your accent ribbon in 1 6 and 2 5 inch strips. 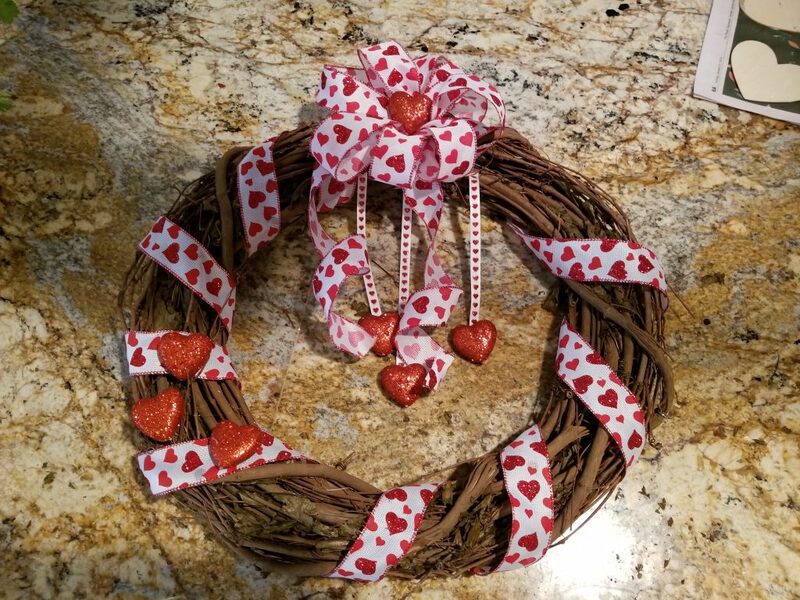 If you want more hearts in the middle of your wreath. Place them at first to adjust for length and spacing. 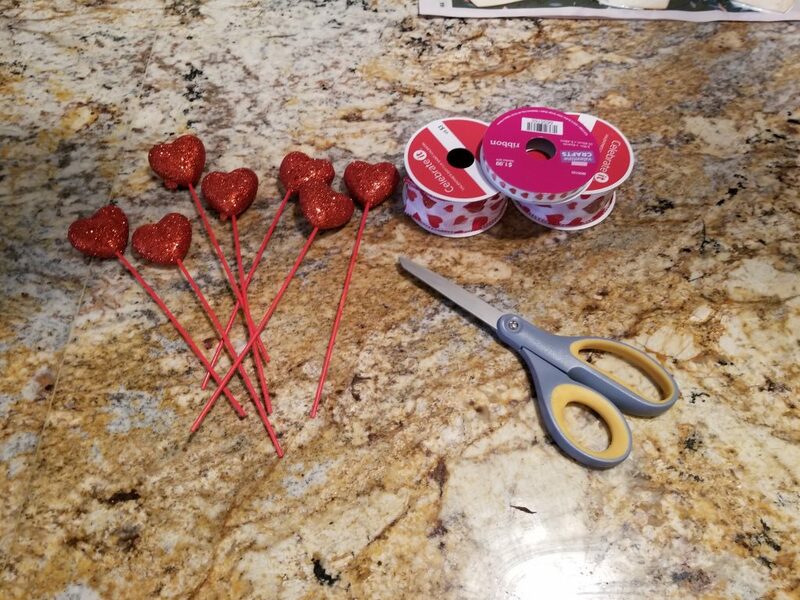 When you are ready to attach them, first attach the heart to the end of the ribbon with a bead of glue. Then affix each hart ribbon to your wreath, working from the center to the edges. Using your second roll of wreath ribbon, make a bow by folding the ribbon in 9 even loops, pinch in the middle and secure by twisting the floral wire around the middle This is a quick and easy bow that also looks really good on Christmas trees! Add a streaming tails to your bow if you wish and use the wire to curl them a smidge. Our last part of the process is going to be placement of accessory parts. I like to start with a focal point at the bottom or side of the wreath to balance the big bow and flowers that will be up top. 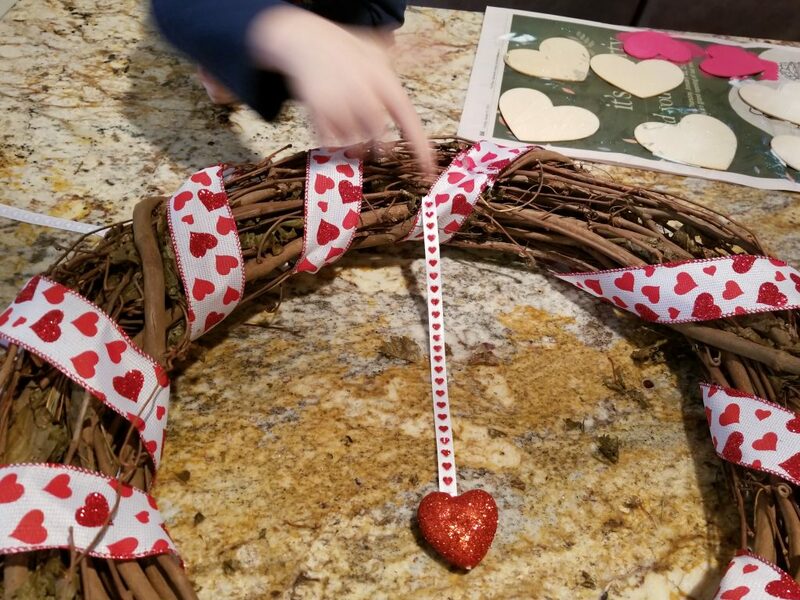 I take additional hearts and place them at the side of my wreath with my hot glue. Now for the flowers! This really made it feel a bit Spring-y to me. Cut the flowers into individual stems, leaving the leaves in place. Begin with the large bow at the top. Place the tulips in groups of three by placing a bit of glue on the base of each flower and stem where the bud and stem meet – then a bit down the stem. Slide the flowers into place and press lightly against the flowers to make sure they stick. Keep doing this until you are happy with the fullness of your blooms. Now move back to your accent. I work on balancing the side decorations by working at the extreme outside and then from the center out – this sort of “frames” the area for me so that I have a better gage of how full or how far to space the flowers. 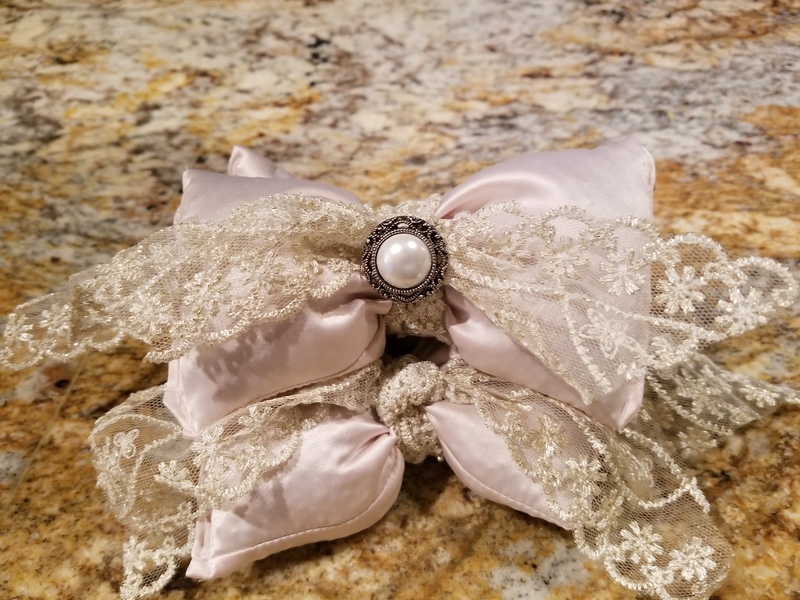 I usually twist my flora wire from the ribbon together at the ends and use it as a hanger, but you can affix a ribbon or wire loop to the back of the wreath as a hanger if you like. Now all you have to do is hang! This wreath only took about 20 minutes to assemble. The pieces are usually on hand and flowers were the most complex items to deal with – and they were pretty easy. Enjoy! 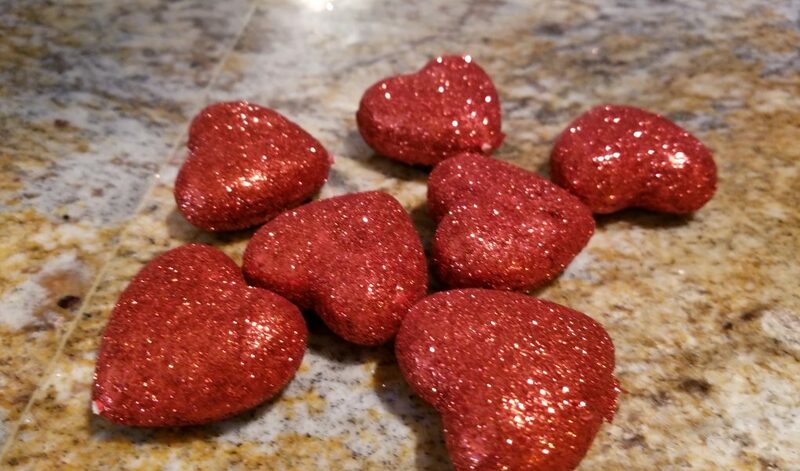 What are your favorite decorations to put up for Valentine’s Day?